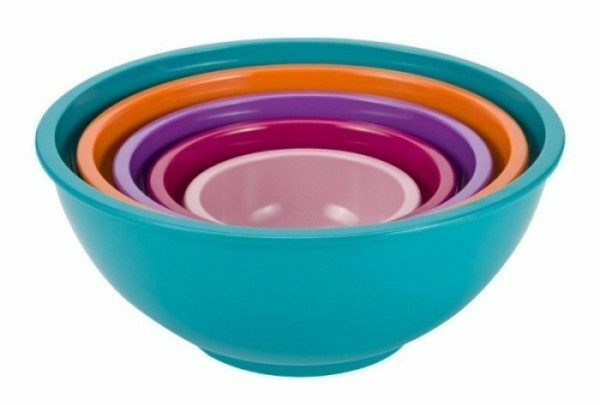 Zak Designs Caribea 5-Piece Mixing Bowl Set Only $16! You are here: Home / Great Deals / Amazon Deals / Zak Designs Caribea 5-Piece Mixing Bowl Set Only $16! If you’ve been needing a new mixing bowl set, I have a fabulous one for you! Right now, you can get the Zak Designs Caribea 5-Piece Mixing Bowl Set for just $16 (reg. $44.99)! And, shipping is FREE with Amazon Prime or Super Saver Shipping! We have a set of nesting mixing bowls, and we LOVE them! They’re so much easier to store since they fit right into each other! The Zak Designs Caribea mixing bowl set combines tribal and island colors inspired by quaint seaside villages, adding a bright and zesty color story to any kitchen or table. Made of 100-percent melamine, these bowls are great for everyday use and are even strong enough to handle the electric mixer. They are also stain resistant and top rack dishwasher safe so you can feel confident they will stand the test of time. The set includes five sturdy bowls that nest together when not in use for easy storage. The extra, extra large bowl has 3-3/4 quart capacity; extra large bowl has 2-quart capacity; large bowl has 1-1/4 quart capacity; medium bowl has 20-ounce capacity and small bowl has an 8-ounce capacity. Zak Designs offers a wide variety of dinnerware and travel ware, products at the forefront of tabletop trends for contemporary and on-the-go lifestyles. Playful, unexpected, spirited, colorful, modern, crisp and clean.